Twenty-eight years ago today, Moscow sent troops to Lithuania and killed 13 people in the vain hope of blocking that Baltic country from recovering its independence. The Soviet government even timed this operation while the West was focused on preparations for the first Gulf War in the expectation that there would not be a harsh reaction. Because the three Baltic countries did recover their de facto independence in August and because the USSR fell apart shortly thereafter, many in the West now view 1991 what Western governments did then as a string of brilliantly designed policies that led to these impressive victories. But that is hardly the entire story: indeed, it gets in the way of what is needed now. US-led containment policies and the Soviet leadership’s effort to counter them, something that exhausted the USSR, did play key roles in the demise of the communist system. But neither played the role in the recovery of independence by the Baltic countries or the achievement of independence elsewhere that many now ascribe to them. Painfully few people in Washington or other Western capitals believed that the USSR was an empire or could ever fall apart. Indeed, most were dismissive of that possibility even after Vilnius. And they remained dismissive of the power of nationality to destroy the Soviet empire to the end. Moscow had nukes, the thinking ran, and therefore the USSR could not fall apart. That represented a serious failure of imagination and of information gathering. Few in the governments or the societies in the West believed that there could be a post-Soviet future and therefore stayed with Moscow far longer than was necessary and ignored the non-Russian nations far more than was justified. Of course, because the non-Russians ultimately succeeded in escaping from the grasp of Moscow, Western leaders ran to take credit for what they had in fact not only dismissed but ignored. And Western scholars and commentators have followed their line, cementing the legend that 1991 was a great victory for the West. 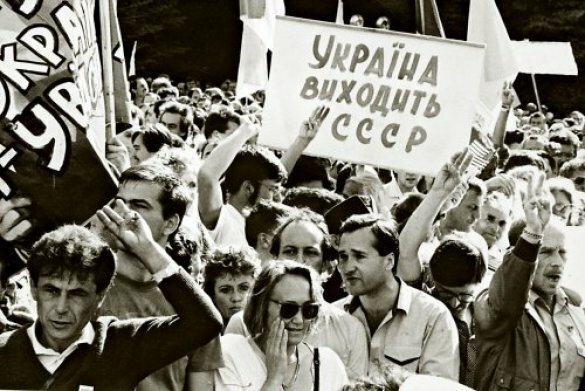 A sign “Ukraine is leaving the USSR” at the rally in support of the nation’s independence next to Ukraine’s Verkhovna Rada in Kyiv on August 24, 1991. In fact, it was a failure, at least in part. Had we been paying closer attention, had we developed expertise about the Soviet Union beyond the ring road around Moscow, we might have been able to design better policies than those that were put in place and have achieved a much better result than what has happened. Indeed, many of the worst developments since 1991 in the region, including Moscow’s vicious Chechen wars and Putin’s rise and imposition of a new and aggressive authoritarianism directed at his own people as well as at Georgia, Ukraine and now Belarus might have been avoided or at least limited. Of course, good information does not guarantee good policy: The former can be ignored if those who make policy choose to. But good policy without good information is all too often a random event. It is certainly something that no one should count on. We in the West “lucked out” in 1991 but that should not keep us from recognizing that we were supremely lucky rather than brilliantly led as far as the collapse of the Soviet Empire was concerned. Far more than anyone wants to admit, we were flying blind because of our own lack of knowledge and our lack of imagination that tomorrow could be different than today. We must pay more attention not only to nations still within the Russian Federation, some of which will eventually form new states as Russia continues its imperial decay. But even more, as the author of these lines has argued, we must focus on regions because in the next round of Russian imperial decay, regions will play a larger role than even the non-Russians. Unfortunately, there are at least three reasons why focusing attention on the regions within the borders of the Russian Federation is more difficult. First, old analysts like old generals fight the last battle over and assume the future will be like the past. 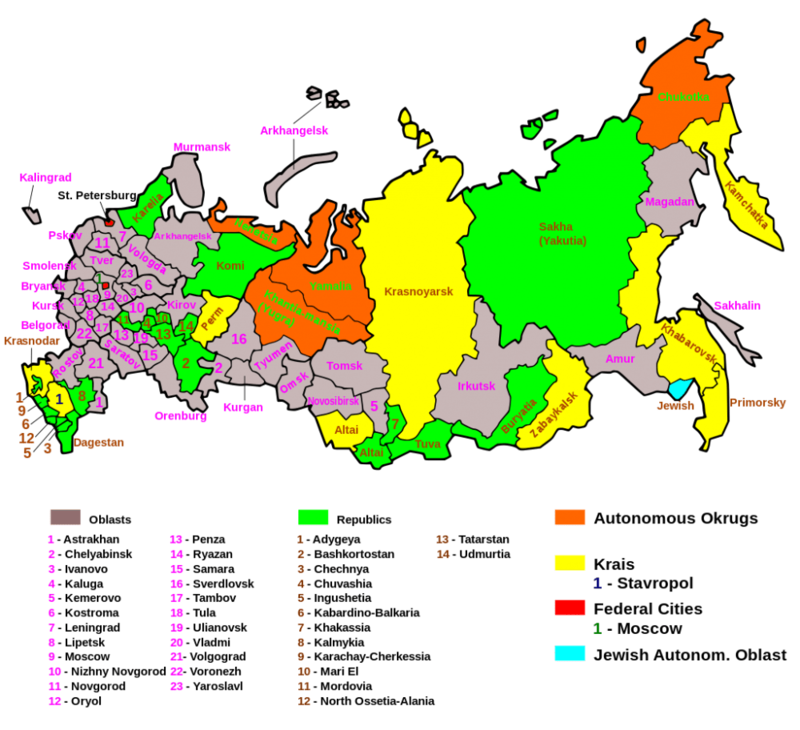 The Soviet Union fell apart on ethnic lines, so the Russian Federation should do the same, in this view. That is a mistake both because the non-Russians form a far smaller portion of the Russian Federation population – they make up less than half of the percentage they did in the USSR – and because the regions, both as drawn by Moscow and even more as imagined by their own peoples, are bigger players. In short, Siberia matters more than Chechnya. Second, studying regions is harder than studying nations. Not only is there the widespread but false notion that only ethnicity matters but there is the even more widespread and more false idea that those Moscow identifies as “ethnic Russians” are united and the same whether they live on the Pacific coast or in the exclave of Kaliningrad. Regionalism doesn’t have the same cachet that ethnicity does and has not attracted nearly as much attention, journalistically, scholarly or politically, as nationalism. But it may under certain circumstances in many countries, even remarkably small ones, play an enormous even defining role. And third, there are fewer reliable outlets for the study of regionalism in Russia than there are for studying nationalism. For every scholar or website examining the former, there are dozens if not hundreds focusing on the latter. There are some happy exceptions, but they are far fewer and have less support than they deserve. If that doesn’t change and if the West doesn’t focus on regionalism as well as nationalism, it may take credit for the next phase of the demise of the Russian empire; but as after 1991, its failure of imagination in the period leading up to that demise will harm both its interests and those of the regions and republics now within the borders of the Russian Federation.